Say hello to the new ‘do! I chopped off about six inches a couple weeks ago, and while I have one more outfit post featuring my longer hair coming, I couldn’t wait to share a peek! Every day I’ve been attempting to style it a new way with new products, so I’ll report back soon on my favorite looks and combos. In the meantime, you can keep up with those hair updates on SnapChat. Isn’t this such a cute pre-fall outfit?! 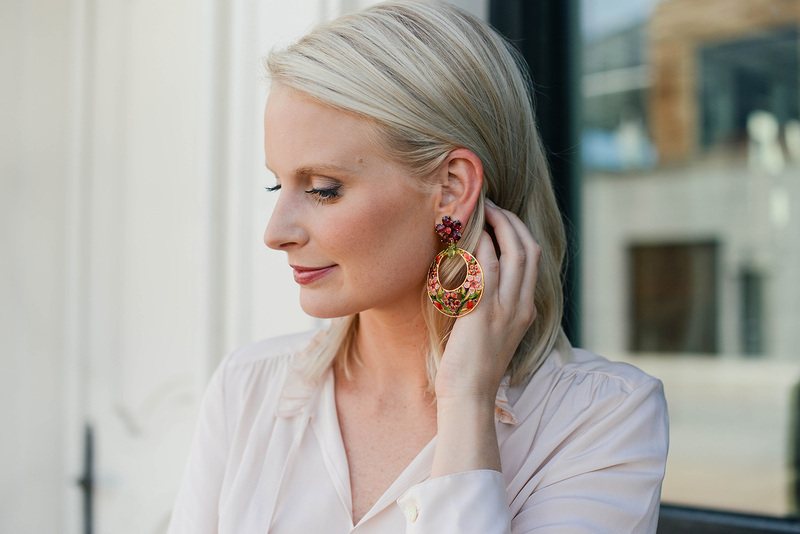 I fell head over heels in love with the color palette in these gorgeous earrings from kate spade new york, and have been dying to create an outfit around them since they arrived on my doorstep. Ever since new fall arrivals have been hitting my favorite online shops, I’ve been craving a wardrobe switch for the new season. Unfortunately I can’t wear most of my fall favorites until much later in the season (thanks, Texas! ), but I can satisfy that craving with a pop of fall color. 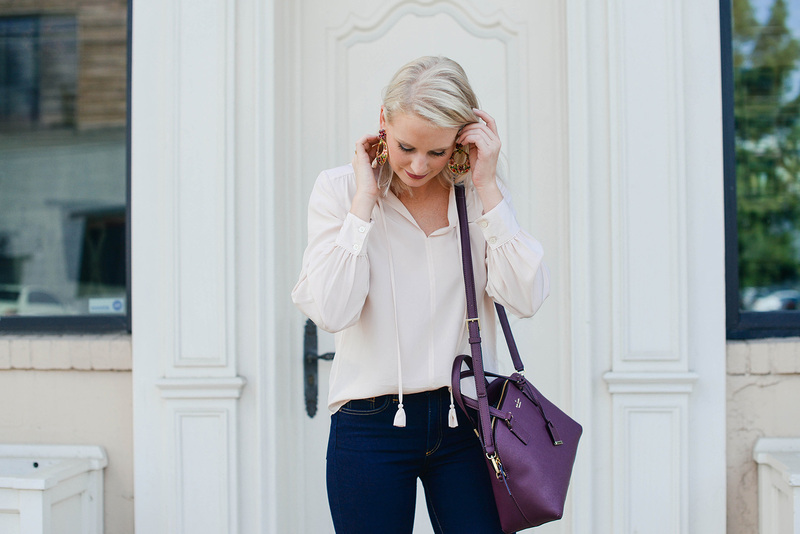 These earrings and this bag lend the perfect punch to my go-to jeans and blouse combos, don’t you think? 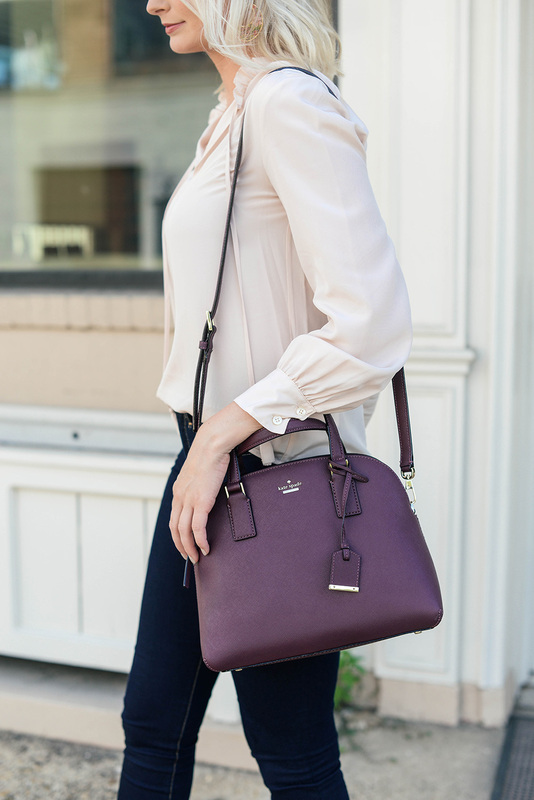 The deep plum color on this bag is absolutely gorgeous – so rich and luxe looking! To keep with the fall color theme, I paired the earrings and bag with dark wash jeans and a romantic pale pink blouse (which is also a big color trend for fall). Add suede sandals for a transitional, weather appropriate ensemble! This ruffle fit and flare dress looks incredibly flattering, is perfect for work and comes in black or burgundy. If mules are on your list like they are on mine, check out this little leopard pair. The velvet bow is the icing on the cake! Remember the black tweed dress I bought last winter? They recreated it this season with sleeves! I love this Clarise crossbody bag that easily converts into a clutch! So many useful colors available. This lace pleated skirt is a great Sunday style staple in black or amaretto (a pale pink/beige). So pretty! Love this classic blouse and the new hair. Love the look! Those statement earrings are stunning!! Those earrings are just beautiful! Loving the pop of purple, too. I love your hair!!! adorable! Love the new do Merritt! Your hair looks so full. Love your new hair! And that bag style and color are gorgeous! We love all the new fall arrivals at kate spade!